I just scored some 100gn partitions, anyone recomend a powder? I was thinking maybe Re22 or Re19 my barrels a 24" 1:10 twist. Anything with 4350 or 4831 on it will do fine. RL22 is our go to powder for 95 and 100 grain bullets. I thought RL22 may have been a bit slow was thinking of not opening it changing to 19. I'll try the 22 at 47gns and work up. Gidday Bob, welcome aboard The Nut mate. Grab a beer and pull up a stump. Personally I have always been a fan of the ADI powders, but that may be because they were cheaper than the imports when I started reloading. I get great results from my .243 with 85gn bullets using AR2208 (Varget). Have not tried the powders mentioned above, but the guys that answered know their sh1t mate. Yup...know all about that "greener grass" mate. AR2209 is a good powder (use it for 55gn bullets in the .243), but I found I got better results using the 2208 using the heavier bullets, in the .243 and when using 55gn bullets in the .223. Also use 2208 in my 30.30 with 150gn pills with good results. Oh well mate, keep experimenting...that's what this reloading thing is all about...experiment and learn. We have a few Aussies on here amongst the KIWIs, Yanks and others mate, so you will find that there is a good spread of experience and info available from all over the world. 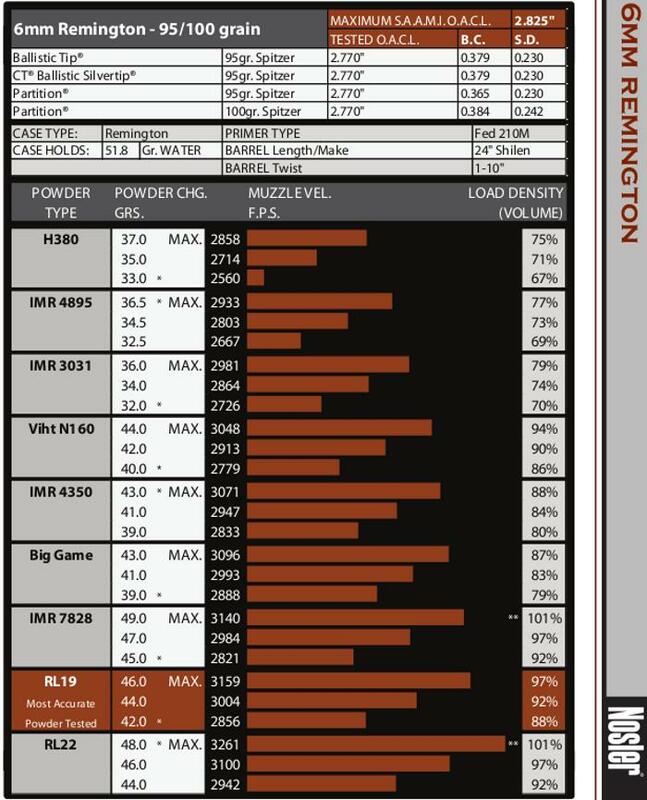 Good choice using RE19 & RE22 powder for that case, with these 2 powders it provides the best accuracy while maintaining a velocity increase over the other powders. Here is a scan from the #7 Nosler book. I'm off to the range today, 100gn pills loaded up from 46.5 - 49 in .5 gn steps. I'll crony those, I'll be happy with 3100fps. I'll let you know. Well!!! I run some tests at the range using RL22 with mixed results. 100gn Sierra game kings 2 touching the third a flyer out to 1 1/2" with the first 3 loads, velocity was all over the place till 48gns @ 3210-3212fps 1 1/8" group for 3 shots, bolt lift getting a little bit stiff. Great velocity but I'll give RL22 the flick and try RL19 otherwise go back to ADI2209. 3200 with 100g Sierras that's awesome, sounds more like a 25-"06 then a 6mm. No wonder your getting a little resistance on the bolt. I bet the bullet performance would be devastating on sheep and the like. Bit too much for meat hunting though!!!! this just sounds like a "magic" combo if the rifle is easy to carry.